Bill Gross, co-founder of Pacific Investment Management Co., seen here on May 25, 2016, is retiring after four lackluster years at Janus Henderson Group. (Bloomberg photo by Patrick T. Fallon). 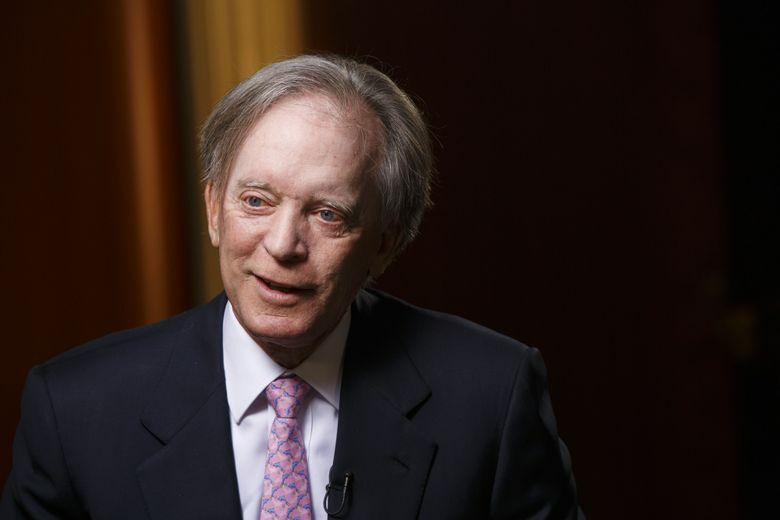 Bill Gross, who pioneered a style of investing that revolutionized bond funds, announced his retirement last week after a shaky four years at Janus Henderson Group. Gross, 74, known as “the bond king,” co-founded Newport Beach, California-based Pacific Investment Management Co., or Pimco. Through his total return bond strategy emphasizing a bond’s price performance as well as its yield, he helped build Pimco into a $1.7 trillion money manager specializing in fixed income. He was a frequent television guest, expounding on investing, bonds and the economy from a studio in Pimco’s offices. Gross amassed a fortune and a global following while riding a decades-long bull market in bonds at Pimco. He left in 2014 after clashing with colleagues. The resignation shook the investment community. “One of the biggest investment personnel-related events that I have seen in my almost two decades in the industry,” said Todd Noel, senior research director for global manager research at the Wells Fargo Investment Institute. The magic at Pimco did not travel with him to Janus Henderson Group, where he invested a large chunk of his fortune in a global unconstrained bond fund. His fund has underperformed its benchmark since Gross joined Janus Henderson in late 2014, although its nominal performance has been positive over the period, according to Janus Henderson. The fund returned negative 3.88 percent in 2018, according to Morningstar. It experienced roughly $1.165 billion in net outflows since March 2018 and has lost nearly half of its total assets. Gross is a one-time long-distance runner and Midwesterner known as a quirky character. His legend includes a successful, four-month run at Las Vegas blackjack tables that helped fund his MBA at UCLA. He developed his “total return” strategy at Pacific Mutual Life Insurance Co. in 1971. “His real claim to fame was pioneering total return investing in fixed income,” said Miriam Sjoblom, director of fixed-income ratings at Morningstar. “That means you are not just concerned with collecting income. You are concerned with price appreciation and avoiding losses. “The fact that he was able to popularize a style of investing that didn’t focus on yield changed the industry,” Sjoblom said. Gross became a multibillionaire, with a world-class stamp collection, art work and a seat on the Forbes 400 list of richest Americans. The ride began to slow even before his sudden, handwritten resignation from Pimco in September 2014. The departure followed reports of erratic behavior by Gross and infighting at the money management firm. Pimco chief executive Mohamed El-Erian departed in early 2014, praising Gross amid reports that said the two were in open conflict. Gross was dropped from the Forbes 400 last year, and saw his wealth take a hit in an ugly, high-profile divorce that included fights over art, homes and cats. Gross said in a statement accompanying the retirement announcement that he will pursue his philanthropic activities. That includes the $390 million-asset William, Jeff and Jennifer Gross Family Foundation, which the bond investor oversees. Gross has given away $800 million over the last two decades. “I’ve had a wonderful ride for over 40 years in my career — trying at all times to put client interests first while inventing and reinventing active bond management along the way,” Gross said in a statement accompanying his retirement announcement. Awards: First portfolio manager inducted into the Fixed Income Analysts Society’s Hall of Fame (1996). Bond Market Association’s Distinguished Service Award (2000). Institutional Investor magazine’s Money Management Lifetime Achievement Award (2011).